Need more proof Donald Trump is bringing his business savvy to the campaign trail? He has already trademarked his "Make America Great Again" slogan. Yes, Ronald Reagan may have said it first, but Trump is the one asserting his commercial rights to the phrase. Trump applied for a trademark for "Make America Great Again" in November 2012 -- mere days after the last presidential election. Trademark applications typically take a long time to process. Trump only received the "Make America Great Again" trademark in July of this year. Here's where it gets interesting: The trademark is specifically for "political action committee services." In other words, it doesn't say anything about hats, T-shirts, etc. 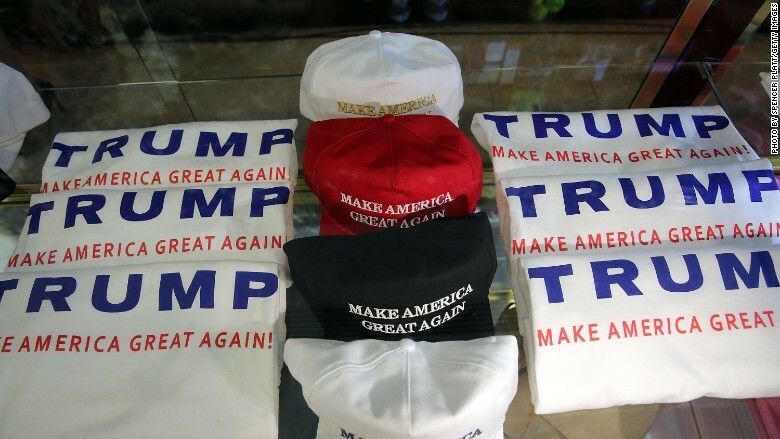 Ever since Trump started sporting his red hat in early August with "Make America Great Again," it's become a hot seller online. And not only on Trump's website. Supporters can buy the hat -- in numerous different colors -- for $25 directly from Trump's campaign merchandise website. Or they can get a ripoff version from thousands of other sellers for as little as $4.99. Trump has had enough of the copycats. Now he's getting his lawyer involved. One of his first targets is CafePress, a popular website where people can print T-shirts, coffee mugs and other garb. The company received a "cease and desist" letter from Trump's lawyer at the end of September. Trump's legal team made it very clear there would be a lawsuit against CafePress unless the site stopped peddling "Make America Great Again" merchandise. "This isn't about money. 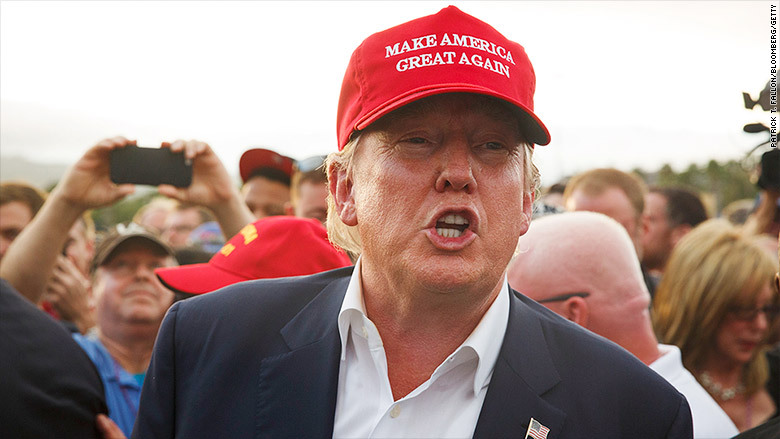 This is about protecting one's brand and trademark," Trump's lawyer Alan Garten told CNNMoney. CafePress hasn't issued an official response, but it's telling that there used to be hundreds, if not thousands, of items available on CafePress with Trump's motto. Searching the site now for that slogan returns nothing with that exact phrase. Trump has repeatedly stressed that he's a billionaire who is self-funding his campaign and doesn't need outsider's money. But he has also made it clear that he knows how to build a brand. He's made a lot of money licensing the Trump name on everything from hotels to ties. Now he's ready to do the same with "Make America Great Again." To clear up any confusion, Trump applied for another trademark on August 13. This one spells out that the trademark covers bumper sticks, T-shirts, tank tops, campaign buttons, caps and hats, baby clothing, blogs. The list goes on. It could take months, if not years, for that trademark to be approved. In the meantime, legal experts say Trump may still have a valid case against CafePress and other sellers. Paul Callan, CNN's legal analyst and a former media law professor, says Trump's lawyers can likely build a solid case that America now associates the phrase "Make America Great Again" with Trump, similar to the way people associate "Just Do It" with Nike. "In the public mind, [Trump] has a legitimate argument that the phrase has a commercial secondary meaning," says Callan. Related: How many jobs has Donald Trump created? For now, Trump's lawyer says the campaign will "selectively" enforce trademark rights. When asked for comment, an Etsy spokeswoman said the company "takes intellectual property and copyright concerns very seriously" and that the site "removes items when we have proper notice." Amazon and eBay did not respond to requests for comment. Trump isn't the first to trademark campaign materials. Obama's campaign applied for trademarks for the rising sun logo, among others. In this election cycle, Republican Ben Carson also sent a cease and desist letter to CafePress for alleged violation of trademark and copyright. The company issued a response to Carson: "To borrow from a slogan that is much used in this campaign, it doesn't take a brain surgeon to understand how baseless these claims are."